A photograph from the Wylie House collection is identified! The Wylie House image collection contains numerous photographs of unidentified people, or people whose identifies are unconfirmed. Recently, this image of a beautiful woman adorned in white was identified by her great-grandson, who was conducting genealogy research. 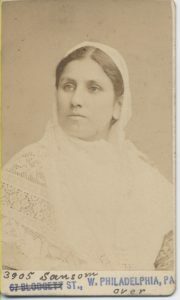 Pictured here is Madame Layyah Barakat of Syria. “As a young girl, she became acquainted with Christian missionaries from America. After she married Elias Barakat (from Damascus) they, and their first child, my great aunt Emily, fled the violence in their land, coming to America to seek those sponsors who had provided for her education through the missionaries. In conjunction with Women’s History Month, we celebrate Madame Barakat’s remarkable strength and resilience in overcoming adversity, living a meaningful and inspirational life, and making the place of her birth a better version of itself before her death. Evidence of her legacy can be found in the books she wrote, newspaper articles written about her and of course, her family. Below is a resource of links that will take you to various newspaper articles that mention Madame Barakat. Also of interest is her Smithsonian Institution record, where her photograph is part of the Faris and Yamna Naff Arab American Collection, ca. 1880-1950. “In one of her books, ‘Lebanon: A Harvest of Love’, she goes into great detail on the hardship of securing passage to America, and their almost hopeless quest to find her sponsor, once in Philadelphia. We at Wylie House whole-heartedly agree. Wylie House is unable to pinpoint the exact connection between Madame Barakat and the Wylie family, but we think it is likely through their shared connections to Philadelphia (where Theophilus Wylie was born) and their work within Christian communities, particularly the W.C.T.U. [Woman’s Christian Temperance Union]. We thank Gary Wirstad for confirming her identity and sharing the beautiful and inspiring story of Madame Layyah Barakat with us. Indiana University’s Image Collections Online is the digital repository for numerous image collections. Explore here! This post written by graduate student Sarah Rogers. Posted on March 9, 2017 December 13, 2017 by Author Sarah Rogers Posted in | Leave a comment on A photograph from the Wylie House collection is identified!